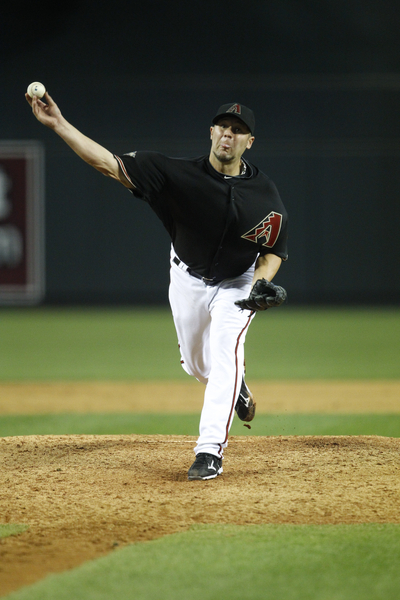 Throughout July, Micah Owings has been one of the more consistent arms out of the D-backs’ bullpen. The right-hander has made six appearances this month for a total of six and 2/3 innings. During that time, he’s also allowed just a single earned run and four hits. Owings’ ERA in July is a sharp 1.35, while opponents are hitting just .182 against him. Overall this season, he owns a 3-0 record with a 2.76 ERA in 16 appearances, 14 of which have come as a reliever. His days in the bullpen may be over, at least on a short-term basis. Owings’ success has earned him an opportunity in the starting rotation. D-backs manager Kirk Gibson announced on Friday that he will start Sunday’s contest against the Rockies. Prior to last season, Owings had been a starter for the majority of his career. In five seasons at the big league level, he’s made 66 starts. The 2010 season was the first in which Owings was primarily a relief pitcher. He appeared in 22 games last season as a member of the Cincinnati Reds’ bullpen. While he was accustomed to starting, Owings appreciates the chance to pitch in the Major Leagues. After making two starts earlier this season, Owings is looking forward to starting again. The right-hander will toe the rubber against a multi-talented Rockies lineup. Owings has pitched well against Colorado in the past including a 3-0 record and 1.12 ERA in three starts. He’s held Troy Tulowitzki to a .167 career average against him.